Nowadays, running more than one operating system on your computer is a breeze. Modern Linux-based operating system installers, for instance, take most of the hard work out of setting things up -- it used to be a much more difficult affair. It is not uncommon for people to dual-boot, say, Windows and Ubuntu. Heck, some folks even tri-boot with OS X. A problem with running multiple operating systems on one machine is Bluetooth pairing. If you own a Bluetooth mouse, for instance, every time you switch the OS, you have to pair again. This becomes extremely tedious. Today, Logitech announces a product that alleviates that pain-point. Called the M720 Triathlon Multi-Device Mouse, it allows easy switching between up to three computers and/or operating systems. "Designed for people who switch between multiple operating systems and screens, the Logitech M720 Triathlon Multi-Device Mouse can help boost productivity for people who work and live in a multi-device world. 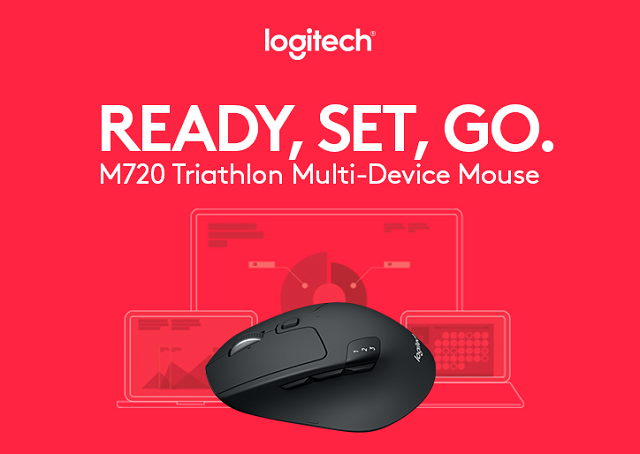 Thanks to Easy-SwitchT technology, the M720 Triathlon can pair with up to three devices, and seamlessly switch between them with the touch of a button", says Logitech. The manufacturer further says, "the mouse features dual connectivity, so you can connect to your devices through the included Logitech Unifying Receiver or Bluetooth Smart wireless technology. With a hyper-fast scroll wheel and durable design, the M720 Triathlon Multi-Device is ready to go the distance – no matter how long your to-do list might be. It has a full-sized sculpted shape that fits comfortably under your hand, and, with the Logitech OptionsT software, you can customize your experience to fit your Windows or Mac OS X needs". Logitech lists support for Windows, Mac, Android, and Chrome OS, but omits traditional Linux desktop operating systems. With that said, a Bluetooth pointing device should work on Ubuntu, Fedora, and others without issue. The company produces a similar multi-device keyboard called the K480 which I reviewed here. That device worked fine with traditional desktop distros -- the Logitech M720 Triathlon Multi-Device Mouse should too. It is interesting that the mouse supports connectivity with either Bluetooth or a USB dongle. I like this approach, because the dongle can be used when navigating your computer's BIOS if it supports a mouse pointer -- something not possible with Bluetooth. It will also allow it to work with computers that do not have Bluetooth, such as desktops and older laptops. The Logitech M720 Triathlon Multi-Device Mouse is not rechargeable, instead using an AA battery. While some folks will be disappointed by this, keep in mind that Logitech claims 2-years of usage on that little battery. Road warriors can easily buy AA batteries at convenience stores and airports, making it preferable to recharging for some. If you want to buy it, you can pre-order it here for $69.99.